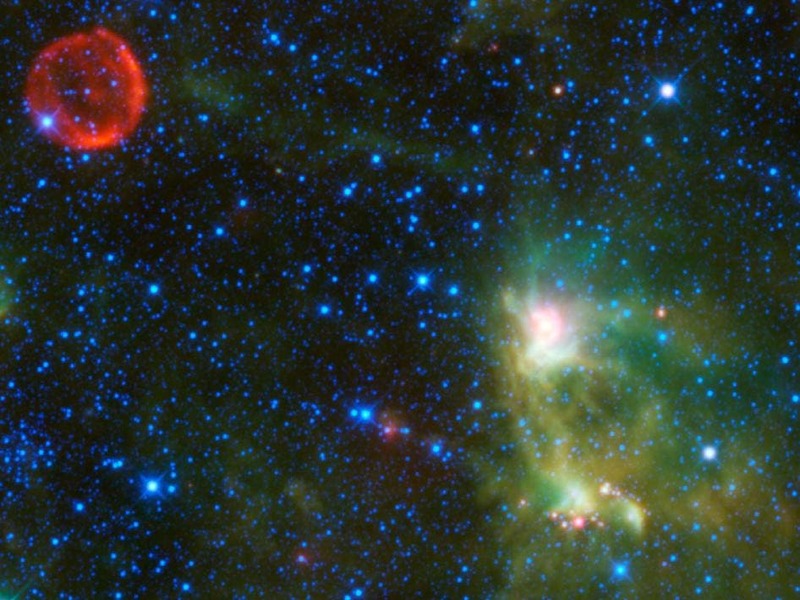 Tycho's Supernova, the red circle visible in the upper left part of the image, is SN 1572 is a remnant of a star explosion is named after the astronomer Tycho Brahe, although he was not the only person to observe and record the supernova. When the supernova first appeared in November 1572, it was as bright as Venus and could be seen in the daytime. Over the next two years, the supernova dimmed until it could no longer be seen with the naked eye. In the 1950s, the remnants of the supernova could be seen again with the help of telescopes. When the star exploded, it sent out a blast wave into the surrounding material, scooping up interstellar dust and gas as it went, like a snow plow. An expanding shock wave traveled into the surroundings and a reverse shock was driven back in toward the remnants of the star. Previous observations by NASA's Spitzer Space Telescope indicate that the nature of the light that WISE sees from the supernova remnant is emission from dust heated by the shock wave. To the right is a star-forming nebula of dust and gas, called S175. This cloud of material is about 3,500 light-years away and 35 light-years across. It is heated by radiation from the young, hot stars within it, and the dust within the cloud radiates infrared light.